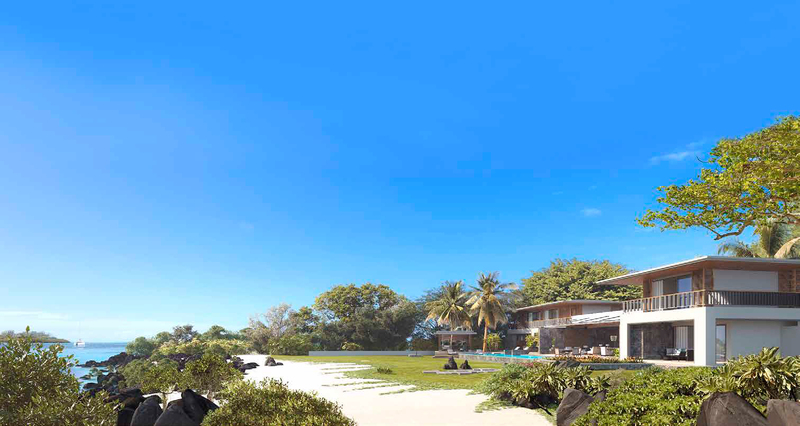 Contemporary interpretation of the elegance of past Mauritian chateau lifestyle. 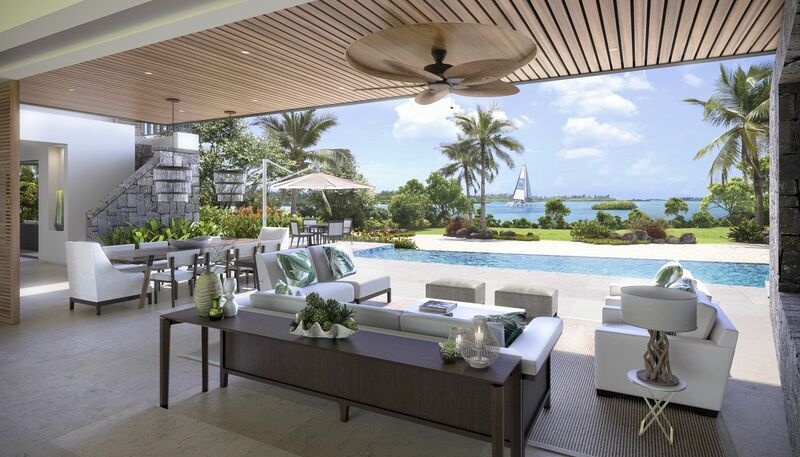 All-seasons veranda living, generous spaces with a flowing living environment. Breathtaking ocean view from all rooms. Elegant entrance with natural landscaped gardens flowing to the lagoon. Perched beach in front of a generous pool. Simple and elegant, with large overhanging roofs and soothing shadows. 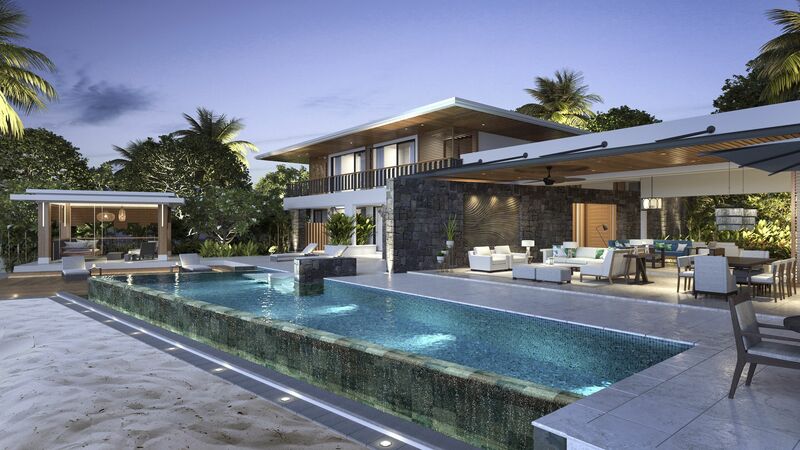 For its exclusive seafront plots in the Rive Est neighbourhood, Anahita Mauritius has solicited the expertise of Macbeth Architects to create one of three concepts offered on this prime location. Using the renowned Mauritian colonial houses, also called “Chateaux”, as a source of inspiration, Macbeth Architects have deconstructed the classical architectural style and reassembled it into a contemporary concept where the old meets the new. Using key features such as a spacious veranda (covered terrace) calling for life outdoors all year long as well as airy rooms inviting the natural light to flow in, the villa is the ideal interpretation of elegant tropical living. The impressive entrance leads to a convivial living room which subtly opens onto the terrace and creates a welcoming space at the heart of the villa. All rooms enjoy magnificent views of the clear lagoon. The essence of the concept is also reflected through the use of modern and authentic materials such as volcanic rocks, and additional organic touches such as eco ponds confirm the inherent role the nature plays in providing a unique living experience. Offering up to 5 rooms between 500 and 550m² of living space, this Macbeth Architects villa can be tailored to your requirements and inspirations. We invite you to create your ideal home and art de vivre, implanted on a unique site with the sea at your doorstep. Following your choice of architectural concept, we invite you to create your ideal home and art de vivre, implanted on a unique site with the sea at your doorstep. Architect ALISTAIR MACBETH is a member of the Royal Institute of British Architects and of the Mauritius Architects Association (MAA). He is the precursor architect of mansion and hotel style on the island in this new century. Famed as one of the best architects in Mauritius, his approach had a definite impact on Anahita and many other local and international projects. In 1986, he established his own company: Macbeth Architects. Well-established links with overseas architectural practices in both the UK and South Africa gives them a crucial advantage: the ability to call upon the expertise of various specialists whenever required. Their portfolio boasts a varied schedule of achievements, including Anahita and numerous projects in Seychelles and the Maldives.